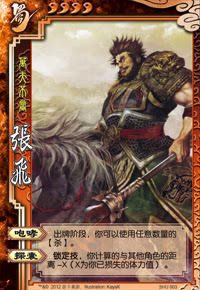 Zhang Fei has no restrictions on how many times he can attack during his turn. Zhang Fei's range is increased by X. Where is X the difference between his maximum and current health. 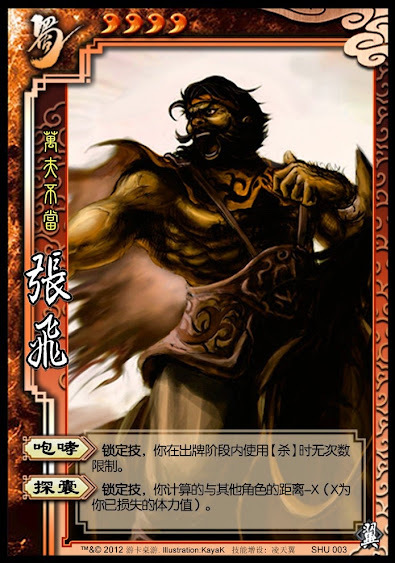 "Roar" is the same power that the original version of Zhang Fei has. "Exploration" adds bonuses to Zhang Fei's normal reach. This is similar to "Horsemanship" that helps characters like Ma Chao. Zhang Fei canincrease his reach to a greater degree. The additional reach provided by "Exploration" applies to all cards, not just Attacks. This also stacks with the horses that Zhang Fei has equipped.